I’ve mentioned before on this site that one of the best things about being a parent is sharing my interests with my kids. Take basketball, for example. It’s always been my favorite sport. B’s picked up on that vibe and become a huge hoops fiend, too. If he’s not playing ball, then he’s talking about it constantly. 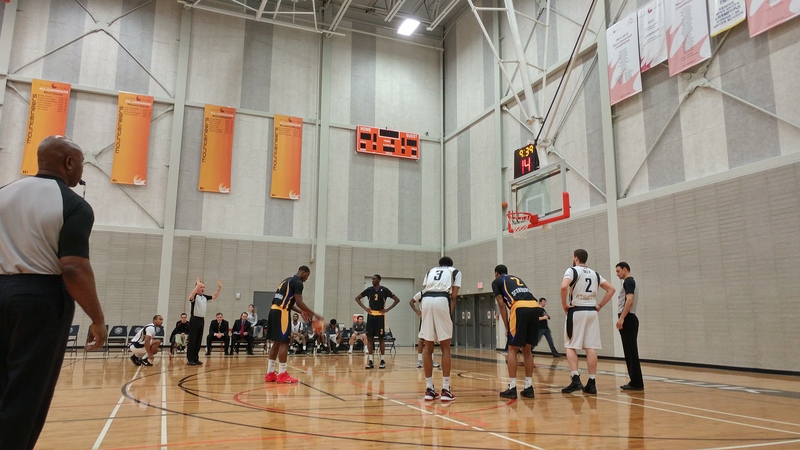 It’s that interest which led me to stumbling onto the Canadian Basketball League (CBL). The CBL is the brainchild of Butch Carter, the Toronto Raptors’ former head coach. It’s a fledgling, four team professional league in its first season, with all four teams located in the GTA. I discovered this while randomly looking at things to do one weekend recently. To my surprise, one of the teams is located in Hamilton. 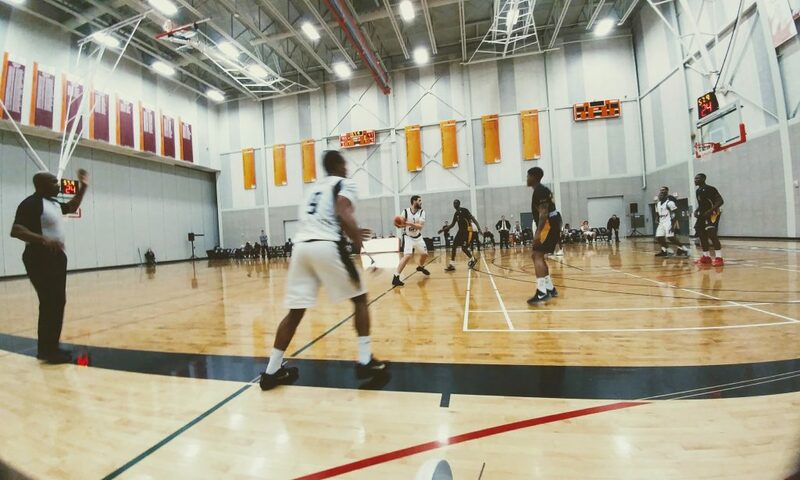 As such, I copped a couple of tickets, and B and I checked out a game: the Hamilton Basketball Club vs. the Scarborough Basketball Club. You’re probably now wondering what the game was like. And to that I say it was…….professional. Lemme explain. I think one of the keys to operating any sports league or team is to not come across as rinky dink, or lame. With that said, I think the CBL does a pretty good job with that. The league website looks pretty slick, for example. They also have their own online ticket buying site, as opposed to going through Ticketmaster, which I think is pretty clever (both them and the consumer save paying Ticketmaster fees). They even have a TV deal, as they show some games on Yes TV. 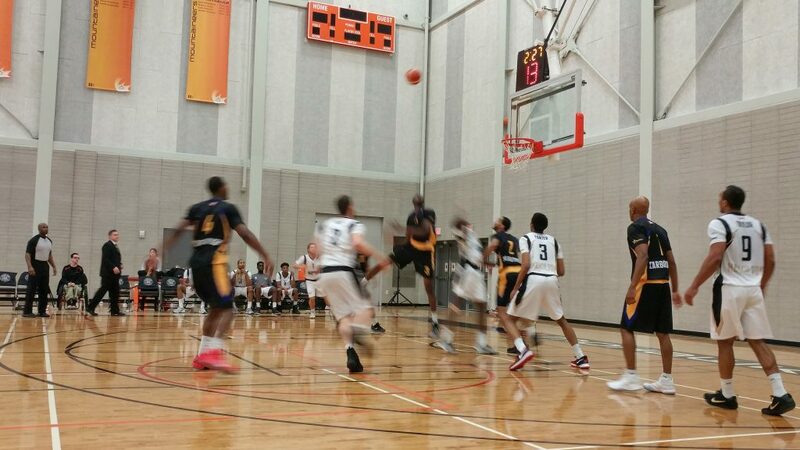 Hamilton plays it home games at Mohawk College, which has a decent sized facility, and a fair number of rafters. B did ask about buying snacks at the game, as we were driving there. Being familiar with the campus, I knew that there weren’t any concessions. However, that just meant we had to make a quick stop at Bulk Barn, to load up on goodies. When we got there, the attendants at the game didn’t care that we brought our own food and drinks. In a neat touch, we were given a free Hamilton Basketball Club rally towel as we walked in, too. In terms of in-game presentation, I was pleasantly surprised. There was an announcer who did his best to hype the crowd up, and played music throughout the contest (similar to an NBA game). The players looked like real basketball players, for lack of a better term, which was good, because they were real basketball players. I read their bios, and they were all legit. From local stars, to former US high school standouts, to college grads looking for another chance, there were a lot of talented dudes, which made for some quality, entertaining basketball. It really is an interesting niche to go after. Ballers who aren’t ready to give up their hoop dreams yet, and need a place to play, to take the next step up in their careers. They are paid for their services, too. There is another league in Canada, the National Basketball League, which is bigger, and has been around longer, and I think does the same type of thing. However, the CBL’s rosters seems to skew on the younger side, most likely by design. One other interesting thing of note. B and I sat in the front row, so we could hear everything that was being said on the court. I don’t know if it was conscious effort by the players and coaches, but we only heard one use of profanity the whole game. The rest of time, there was a lot of “Shoot!” or “Dang it!”, stuff like that. When you’re with small kids, this is huge. I was happy that the atmosphere was so family-friendly. Now, obviously, it’s not the same as going to an NBA game, or even a D-League game. To say the attendance was sparse would be putting it generously. It’s a shame, but I guess that goes with the growing pains of a new league that isn’t heavily promoted. Regardless, it was still fun. We went to a Hamilton Bulldogs (a junior hockey team who play out of the FirstOntario Centre, which is a borderline NHL-caliber arena) game a few weeks prior to the CBL game, and the products were similarly entertaining. B was really into it, by the end, cheering the home team on (even though they ended up losing). It was also an eye-opening experience for him, as he didn’t realize that you could make a living playing basketball outside of the NBA or D-League. When I say that the CBL is professional, I mean it as a compliment. The effort is obviously there, to make for an enjoyable fan experience, and it’s pretty good value, relative to other pro sports in the GTA. Hopefully, the league continues to grow and improve!